With a large amount of money spent on a she-shed, most women can’t afford to dish out a few grand on other updates and renovations. Whether you have funding set aside for furniture, or simply excess funds you are saving for specific decor, you need a way to create the perfect ambiance without breaking the bank. 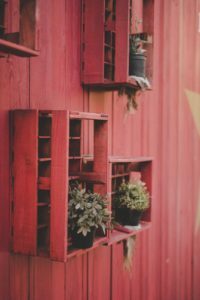 There are a variety of DIY she shed ideas out there that can help spruce up your she shed and turn it into the room you always wished you had. Let us take a look at a few ideas that will help you turn your she shack into a she shed! There are many people out there with creative minds that far outweigh their artistic capabilities. However, many of you out there fall into the other category – individuals with an incredible mind and the DIY mindset to fantasy into reality. 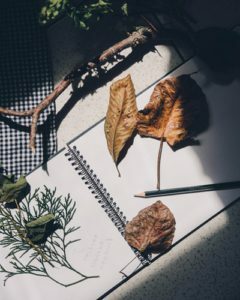 Those of you with scrap booking tendencies are the best fit for this, as you tend to take basic photos and keepsakes and convert them into albums and artistic pieces that bring life to something plain. Using this form of creativity is perfect for she shed decorations, as you are able to take odds and ends and mold them to create something unique and brand new. Why hang plain pictures when you can create wall decor made from various pieces of keepsakes? Rather than a generic picture, you could take a picture or group of pictures, and add different pieces of memorabilia from around the house or from various moments in time and generate something memorable. For example, having a picture of a girl’s night in Vegas with the frame containing tickets from a show you went to, or beads/ party favors from a bachelorette party with your closest friends would lift your basic picture to an amazing talking piece. If you are not an artistic type, or simply are looking to create a she shed with an amazing flower bed or garden, we have you covered there too! Regardless of how big or small your she shed is, a garden or flower bed is a must have! One of the biggest eye catchers in terms of external appearance is a she shed with an amazing garden or flower bed that is filled with either a variety of fruits and vegetables, or a beautiful array of vibrant colors. If many of you out there are like my wife, you love the concept of being able to create a garden in your yard for specific fruits and vegetables to save you money and help with self sufficiency. Just outside my wife’s she shed, she has a variety of zucchini, squash, tomatoes, peppers of all sorts, and (for some reason) pumpkins. This is an easy addition to any she shed, as you can do this in a tiered format, a window or wall floating garden, or simply garden boxes in a size of your choice. The basic garden box is a 4 foot x 4 foot bed, with about 6 inches to a foot in height. This size allows you to have bed large enough to incorporate a variety of veggies or flowers in a limited space. I would not recommend anything larger than this as it would take up too much space and you would not have the appeal of appearance and organization that smaller beds have. 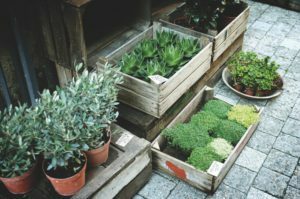 Wood isn’t much of a debate, as most companies create garden boxes that are 4 seasoned and water treated to prevent molding and discoloring. You just need to choose the one that matches the color you want and the price that fits you. Don’t just choose the cheapest option, but you don’t need to buy the most expensive either. If you are looking for floating flower beds or ones that hang from your she shed windows, the same concepts apply, The wood or metal you choose should be one that matches your color, and the size should be one that matches the length you want plus 1 to 2 feet in width. If you want the garden bed or flower bed sizes to match your interior shelving, we have options for that also! 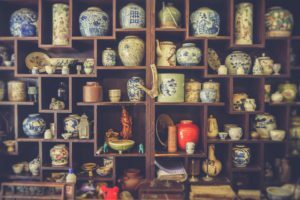 Similar to your external garden and flower beds, interior shelving is equally valuable as it provides the most bang for your buck without taking up much space. One of the biggest issues we face when creating a she shed or man cave is that there is so much we want to incorporate with limited space. The best way to combat that issue is to build shelving along the walls to add not only storage, but display options as well. Whether you are looking for space to place decor or memorabilia, shelving is the perfect option to add optimized spacing without deteriorating your spacing. There are tired aspects of shelving, single wall shelving, or customized shelving that add not only storage and display options, but also an artistic feel as well! A quick google search allows you to see the options and capabilities of customized shelving, creating that artistic feel that ties in to your overall atmosphere. Hexagon shelving, floating shelving, and many other options enable you to turn your basic she shed into your haven away from men! If you are the artistic type and want a DIY project, let’s look at ways to turn throw away items into artistic masterpieces! Crafty women beware – this can be addicting! Decorating your she shed may be overwhelming on sheer thought, but when you break it down in terms of what you can do on your own to decorate it, it becomes much easier! Whether you have a lot of old things left aside that your are saving for that special something, this is the perfect opportunity for you to capitalize on killing to birds with one stone. Turning old metal, wood, or clay objects into decorative pieces can help boost your she shed to another level, as you can use these new pieces on shelving or end tables you bought or created. When it comes to potential, there are far too many ideas to list. For a broad generalization, take a look at my post here and you can gather the gist of it! With so many options out there, what will be your first step? Will you look to create a beautiful outdoor garden or flower box? Or perhaps you will look into the interior and add shelving, DIY projects, or scrap booking concepts. 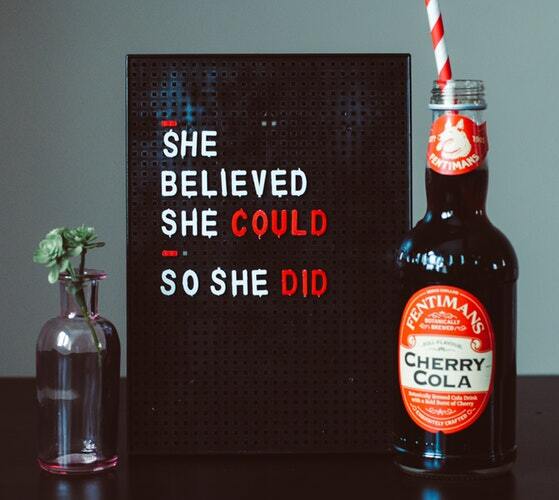 Whatever route you decide to take, know that there are a plethora of options out there – and hopefully we gave you some great ideas to help you begin your she shed creation. As always, if you have and questions or comments, feel free to leave them in the comments section believe and I (or any reader) will get back to you quickly!